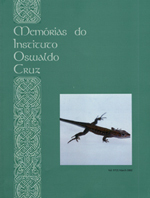 During examination of several species of terrestrial molluscs for larvae of Angiostrongylus (Parastrongylus) costaricensis Morera & Cespedes, 1971 in endemic areas of abdominal angiostrongylosis in Brazil, some other nematode larvae were incidentally found together with those of the above mentioned species. Among others, the following authors have previously referred to the presence of nematode larvae in molluscs: BG Chitwood, A McIntosh (1937 Proc Helminthol Soc Wash 2: 37); H Mengert (1953 Z Morph u Oekol 41: 22); RC Anderson (1960 Can J Zool 38: 801); S Morand (1988 Can J Zool 66: 1796); S Thiengo (1995 Mem Inst Oswaldo Cruz 90: 347-348). However, this is the first report of the larvae identified herein as Strongyluris-like third stage larvae occurring in snails (RC Anderson, personal communication). In this paper data on morphometry of these larvae and prevalence in the hosts are presented. Molluscs were collected from 1990 to 1995 near the areas with people suffering from abdominal angiostrongylosis: Caicara, RS (27.16S 53.26W), Crissiumal, RS (27.30S 54.07W), Santa Rosa, RS (27.52S 54.29W) in the autumn and the spring of 1991; Uberlundia, MG (18.56S 48.18W) in the autumn and the spring of 1993 and 1994. The cephalopodal mass of shelled molluscs and the eviscerated body of the slugs were individually minced and digested with pepsin (4mg%) in a 0.7% HCl solution for 2 hr at 37 C. The digested samples were placed in a Baermann apparatus and allowed to sediment for 6 hr prior to examination. The viscera and the pallial organs of the molluscs were placed in petri dishes with Ringer solution and, as well as the sediment collected from the bottom of the Baermann funnels, were examined under the stereomicroscope for helminth larvae. The latter were processed according to JFR Amato (1985 Manual de Tecnicas para Preparacao de Colecoes Zoologicas, SP, 11p.). En face view was obtained according to RC Anderson (1958, Ann Parasitologie 33: 171-172). Measurements are in millimeters. Strongyluris-like larvae were recovered from digested tissues of Bradybaena similaris (Ferussac, 1821), Bulimulus tenuissimus (Orbigny, 1835), Belocaulus angustipes (Heyneman, 1885), Megalobulimus sp., Phyllocaulis variegatus (Semper, 1885), Sarasinula marginata (Semper, 1885) and Subulina octona (BruguiIre, 1792). Prevalence of the larvae in the molluscs for each locality surveyed is shown in the Table. Fig. 2: Strongyluris-like larva- A:anterior end, lateral view; B: enface view, showing circumoral papillae; C and D: posterior ends, lateral view. During examination of the pallial cavity of Megalobulimus sp. and the body cavity of S. marginata from Uberlândia, prominent cysts containing each a very coiled larva were observed on the surface of the pallial tissues (Fig.1). 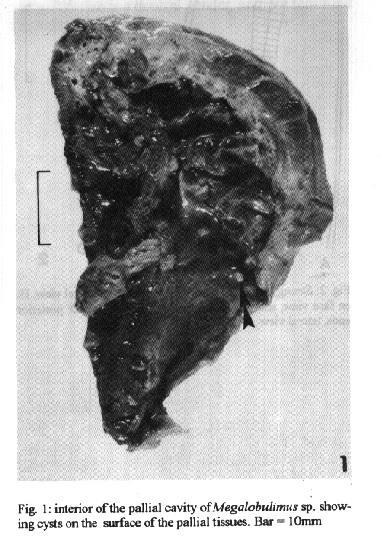 Larvae (40 specimens) were 4.6 - 6.3 long and 0.26 - 0.39 wide; esophagus with bulb, 0.54 - 0.76 long; bulb 0.10 - 0.14 long and 0.08 - 0.11 wide; nerve ring and excretory pore 0.20 - 0.27 and 0.58 - 0.71 from anterior end, respectively; cloacal aperture 0.17 - 0.44 from posterior end (Fig. 2). Morphologic differences refer to short (Fig. 2-c) and long tailed specimens (Fig. 2-d). Specimens were deposited in the Helminthological Collection of Instituto Oswaldo Cruz, no 33.286 a-d (whole mounts) and no 32.987 (wet material). Acknowledgements: to Dr A Agostini, Universidade de Passo Fundo, RS, Dr W Stutz, Centro de Zoonoses de Uberlândia, MG, for facilities during field work. To M Stortti for technical assistance. To Dr RC Anderson and Dr M Adamson, University of Guelph, Canada, and Dr A Chabaud and Dr O Bain, Museum de Histoire Naturelle Paris, for kindly examining the larvae. To Dr RM Pinto, Instituto Oswaldo Cruz, for guidance during this work and for critically reviewing the manuscript.